The Bodu Bala Sena (BBS) organisation has stressed upon the fact that they have never promoted anti-Muslim campaigns nor used hatred or violence as a tool in their activities. In a statement issued to wish the new President and Prime Minister, the organisation has stated that since its establishment in 2012, they have only worked towards safeguarding Sinhala Buddhists under a clear vision and plan but that certain comments they made have been misinterpreted and exploited to promote the notion that they are an anti-Muslim group. “We have never at any point used hatred or violence as a tool but due to certain actions carried out by other groups, the media as well as certain anti-Buddhist groups have misunderstood us,” the organisation has stated. The BBS has noted that although their initial plan was to remain neutral at the Presidential elections that just concluded, they decided to support Mahinda Rajapaksa as a result of the wrongful ideas that were included in the election manifesto of the common candidate regarding religious tensions in Sri Lanka and the overall opposition in the common Opposition camp concerning the BBS. They have stated they view the votes of the North/Eastern Tamils as a deciding factor in the election. “Although the North/Eastern votes are now being interpreted as a vote cast to oust the former President who won the war than a true reflection of their support for the new President, we observe it through an unbiased mindset. We think that their voting for a Sinhalese leader and working to ensure his victory is a blow against the separatist forces and various international groups that attempt to divide this country,” the BBS has said. The group has stated that it shows the will of the Tamils to live in a united country and has emphasized on the fact that the government should work hard in order to ensure it turns into reality than it simply remaining an expectation. “This is a golden opportunity for this government to win the trust of Sinhala Buddhists and this is a chance that we should seize to rid ourselves of the labels of being racists and a creation of the former government,” it has further noted. 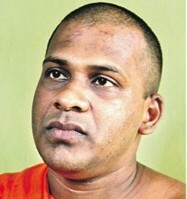 The BBS has also called upon the government to consider gravely, the issues they have highlighted during the past thirty months concerning the safeguarding of Buddhism and Buddha Shasana and the security of Buddhists, pointing out it would help in establishing the trust of the Sinhala Buddhists in the new government.